By Donald & Nancy E.
"Kevin was very polite, knowledgeable for work like that, I..."
"Ryan, Nico & David were prompt & professional. They..."
This Homeowner in Charleston, SC, found that is was hard to cool her house during the summer months. We installed our blown-in cellulose to help with keep the hot air out of the home and less use of the HVAC system. 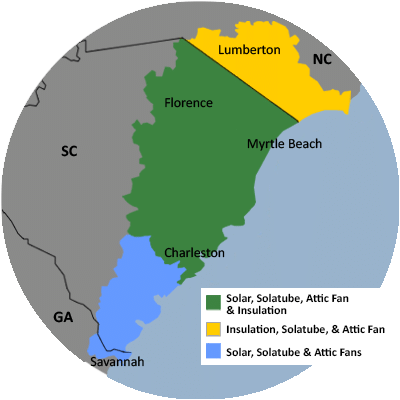 For a FREE no-obligation estimate in Charleston, SC, please fill out the form to the right and Carolina Energy Conservation will contact you shortly. Hello - We are a historic hotel - have some issues keeping the hotel cool in the summer. Wanted to see if we have any options for insulating the property better. We are interested in spray insulation for our attic. Thank you! I'm shopping around for estimates on adding insulation to my existing 4"/R9-rated attic, but am open to alternatives. My footprint is 1180 sq ft - and I'm looking to see what details are included in your service. Thanks for your help! Need attic insulation. Old insulation is compacted and in some areas of attic, no insulation at all. We specialize in a variety of solar and energy conservation services not only aimed to lessen your home's carbon footprint and save energy, but help put money back in your pocket by lowering you energy bills each month! Some of the more popular methods we use to reduce your home's energy consumption include various renewable energy sources such as solar panels, solar attic fans, and even solar hot water. Other energy conservation tactics we use are installing LED lighting, Solatube Daylight systems, hybrid water heaters, and much more. Solar energy is one of the most efficient methods of improving your home's energy conservation while improving the environment. If you are interested in learning more about solar energy for your home, contact us today! Looking to experience additional comfort and energy savings in your home? Carolina Energy Conservation can provide you with a home energy audit to discover what work needs to be done. We offer these services to residents of Charleston and nearby. We perform a home energy audit before we make any recommendations about improving insulation and air sealing. Once the evaluation is complete, we take the time to sit down with you to discuss the results and help you make the best decisions for you home and family. This completed insulation job included blown in cellulose to an R-30. This material conforms to walls and cavities creating a tight thermal barrier that brings homeowners more comfort. In the South the DOE recommends R-value be at an R-20. We took this R-19 and added enough insulation to bring our customer optimal home comfort. Looking to insulate a finished garage. Master bedroom (over garage) cold in winter. Need to replace heat pump and water heater soon. Crawl Space concerns. Humidity, and lack of control of moisture. I have exposed duct work that creates condensation and attic space that I would like to get a quote for spray foam insulation. We have an old Charleston single home that wouldn't hold heat last winter, and our energy bills are very high. We had the HVAC inspected a few times, and they could not find an issue with it. We would like to get the house inspected to see if there might be an issue with insulation, as it feels like the walls get very cold in the winter and very warm in the summer. Excessive amount of moisture under the house. I have had the space beneath my house incapsulated before and want to have it done again. I am in the process of purchasing a 1947 home in Charleston, SC. The attic has very little insulation and a current pest infestation. Once the pest infestation is contained, I would like to have all the current insulation vacuumed out (along with the pest remnants), the attic disinfected and air sealed and new fiberglass insulation (formaldehyde free) blown in. The total square footage of the home is 1185. Can you give me an estimate of what it would cost to do this work? Would you be interested in this job? My son and I actually are considering doing the blown in insulation ourselves in both of our homes, but saw your YouTube video and interested in getting a quote. Our first address is above and my son's address is 1 Lenox St. also in Charleston. These are both rental properties, so we are not there at the moment. We will be there at the end of the month, but would love to get a quote before so we can make our plans. Thank you so much for your time.